Infection-related glomerulonephritis (IRGN) is a typical example of immunological, renal injury due to non-renal infections. This disease is changing its face over the years with regards to its epidemiology, clinical presentation, etiological agents, histopathological, and immunofluorescence (IF) spectrum and its ultimate outcome. Immunoglobulin A (IgA)-dominant IRGN is an increasingly recognized morphologic variant of this disease seen particularly in the elderly. In contrast to classic IRGN, in which there is typically glomerular deposition of IgG and C3 or C3 only, IgA is the sole or dominant Ig in IgA-dominant IRGN. In addition, with the changing picture of IRGN over the years, renal biopsy definitely has an important role to play in differentiating this disease from the other masquerades and helps in prognosticating and defining the long-term outcomes. Active urinary sediments (red blood cells [RBCs], RBC casts, and white blood cell casts). The patients with clinical or laboratory evidence (signs and symptoms of secondary GN or serology markers, i.e., antinuclear antibodies) or a past history of other GN or chronic kidney disease (CKD) were excluded from the study. All the biopsies were performed under real-time ultrasonography guidance using the Bard ® Max-Core ® Disposable Core Biopsy Instrument (Bard Biopsy Instruments, USA). At least, two cores were taken and sent for light microscopy (LM) and IF in all cases. All renal biopsy samples were processed according to the standard techniques of LM and IF. For each patient, six slides, which were stained with hematoxylin and eosin, Masson's trichrome, periodic acid-Schiff, and Jones methenamine silver were reviewed. Systematic analysis on the morphologic changes of glomeruli, tubules, interstitium, and vessels was done according to the practical standardization in renal biopsy reporting. IF staining was performed on 3 μm cryostat sections using polyclonal fluorescein-isothiocyanate-conjugated antibodies to IgG, IgM, IgA, C3, C1q, C4, kappa and lambda (DakoCytomation, Denmark). The intensity of IF staining was graded on a scale of 0 – 3+. All the biopsy samples were confirmed by the same renal pathologist (Anila Abraham Kurien). The histopathological LM diagnosis of IRGN was made by the presence of typical endocapillary or endocapillary with mesangial proliferation with or without the presence of neutrophilic infiltration depending on the stage of the disease when the patient underwent the biopsy. This was coupled with the IF findings of typically high-intensity staining for C3 with or without the presence of staining for other Igs. The diagnosis of IgA-IRGN was made on the basis of staining on IF, in which IgA staining was the sole or dominant Ig deposited in glomeruli, with or without weaker staining for IgG and/or IgM. There was typically high-intensity staining for C3 in these cases, which was either stronger than or equal to IgA in all the cases. The cases of IgA-IRGN were differentiated from that of IgA nephropathy by the presence of hypocomplementemia and an LM pattern of typical endocapillary or diffuse endocapillary with mesangial proliferation with marked neutrophil infiltration with IF showing IgA staining as the sole or dominant Ig with high-intensity C3 staining. The patients were followed up clinically and with relevant laboratory investigations every weekly for the 1st month, every 2 monthly till 1 year, and every 6 monthly thereafter. Only the patients who had a minimum follow-up period of 6 months were included in the final analysis of this study. The Institutional Review Board clearance was taken for the study. Data were expressed as a mean ± standard deviation or where indicated as median and ranges. Chi-square test was used for categorical variables and Mann–Whitney U-test was used for continuous data. P < 0.05 was considered statistically significant. All analyses were done using SPSS ® Software version 17.0 (SPSS Inc., Chicago, IL, USA). A total of 168 patients were suspected and screened for IRGN out of which 137 patients were confirmed to have IRGN and included in the final analysis. Twenty patients were excluded as they did not have a minimum 6 months follow-up and eight patients had an alternate diagnosis after biopsy. Three patients were found to have underlying CKD and hence were not included in the final analysis. Among the 93 patients who underwent a renal biopsy, 16 patients showed glomerular dominant or codominant IgA deposits and were classified as IgA-IRGN. The average age of presentation was 22.7 ± 15.8 years (range: 5–65 years) with a slight male preponderance. There was almost an equal distribution of adults (age >18 years) and pediatric (age <18 years) cases [Table 1] and [Figure 1]. The most common presentation was an acute nephritic syndrome. The mean latent period between the infection and onset of symptoms was 23.36 ± 14.5 days (range: 5–60 days); the most common clinical feature at presentation was oliguria followed by hypertension and gross hematuria. The number of patients having severe renal failure requiring RRT at the onset was 24 (17.5%). 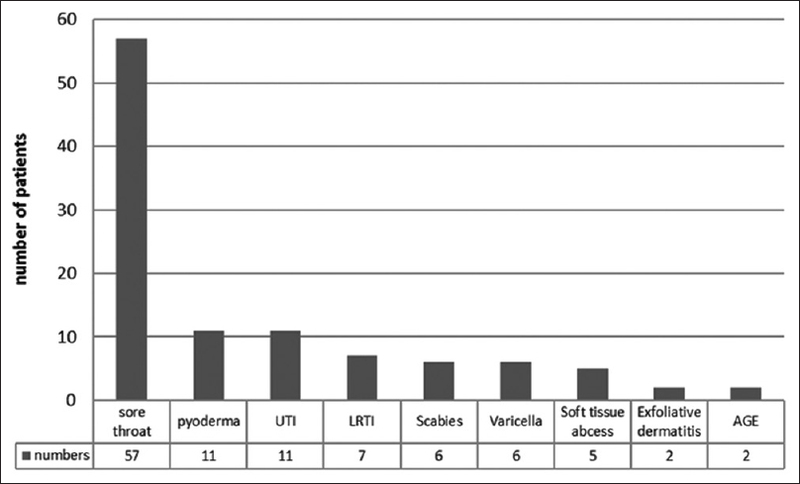 Clinical or microbiological evidence of preceding infection was found in 107 (78.1%) cases with a sore throat being the most common preceding infection followed by pyoderma and urinary tract infection (UTI). Specific microbiological etiological agent was found only in 11 (8%) patients. 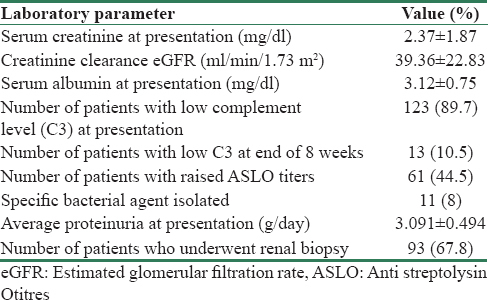 The mean creatinine at presentation was 2.37 ± 1.87 mg/dl with an estimated glomerular filtration rate (eGFR) of 39.36 ± 22.83 ml/min/1.73 m 2 (calculated by modification of diet in renal disease formula) with an average proteinuria 3.091 ± 0.494 g/24 h. 89.7% of cases had a low complement level (C3) at presentation out of which 10.5% of patients had persistent low complement levels at the end of 6 weeks [Table 2]. Of the 137 cases included in the final analysis, 93 patients fulfilled one of the indications for renal biopsy. The most common indication for biopsy was nephrotic range proteinuria both in adult as well as pediatric populations [Figure 2]. The biopsy material was adequate with an average number of glomeruli being 21. The most common histopathological presentation was the typical endocapillary proliferation as described in the classical poststreptococcal GN. Diffuse proliferative changes, which included mesangial proliferation and hypercellularity along with endocapillary proliferation were seen in 39.7% of patients. Acute tubular injury was seen in only 6.4% of patients and crescents >20% of glomeruli were seen in 18% of patients. Occasional cellular crescents (<20%) were seen in 34% of patient. On IF, the most common staining was seen with C3 followed by IgG. Dominant or codominant IF staining with IgA was seen in 16 (18.27%) cases [Figure 3] and [Table 3]. Of the total 137 patients included in this study, 38 (27.7%) patients showed the presence of predominant C3 deposition with minimal or absent Ig staining. The mean follow-up period was 23.36 ± 9.47 months. The most common clinical outcome in both adult and the pediatric patient populations was complete recovery (83.2%) with no sequelae (defined as persistent proteinuria >500 mg/day for ≥6 months, hypertension, or hematuria). Persistent hypertension and hematuria beyond 6 months of diagnosis were seen more commonly in the adult population as compared to those <18 years of age (P < 0.05). Persistent proteinuria >500 mg with normal renal function >6 months was seen in 12 (8.75%) patients. In the 16 patients who showed dominant or codominant IgA deposits (IgA-IRGN), certain initial presenting characteristics such as heavy proteinuria (P = 0.039), hypertension (P = 0.03), and requirement of RRT (P < 0.001) differed significantly as compared to the classical IRGN cases. In addition, the outcomes of IgA-IRGN were significantly worse as compared to the classical IRGN cases with only 31.2% of cases showing complete recovery (P < 0.001) and 37.5% progressing to CKD (P < 0.001) [Table 4],[Table 5],[Table 6]. 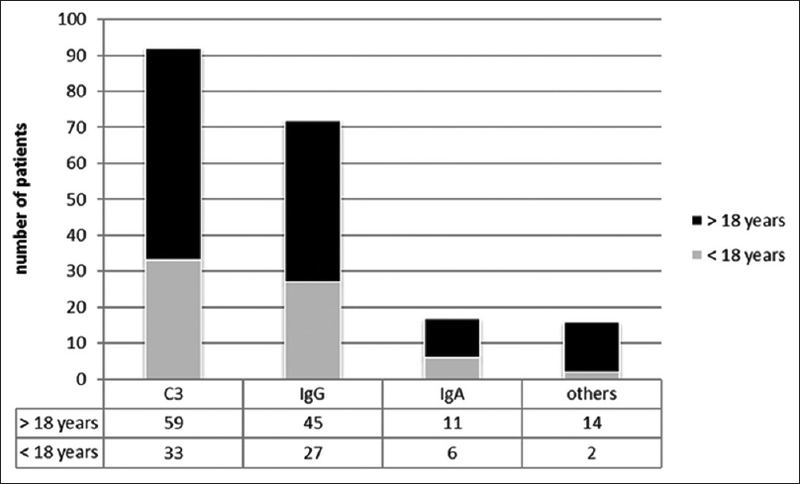 In the 38 patients who showed predominant C3 staining with minimal or absent Ig staining, 29 patients showed complete recovery. Of the group that showed partial/incomplete recovery (in the form of persistent proteinuria) or progressive disease (CKD), five patients had only C3 deposits, and three patients had predominant C3 with minimal Ig deposits on IF. Comparison of the patients who progressed to have persistent renal dysfunction (eGFR <60 ml/min/1.73 m 2 ≥3 months of presentation) with the patients who showed complete recovery, showed no significant characteristic differences except that the patients who progressed to CKD showed a significant higher cases with hypertension at presentation (P = 0.002) and all the 12 cases underwent a renal biopsy signifying the presence of atypical presentation. IRGN is an immune-mediated renal injury, which is caused due to non-renal infections, which are most commonly of bacterial origin. In the past, most cases of IRGN had been described predominantly in the pediatric population usually after a bout of pyoderma or a sore throat. However, over the last three decades, there has been a growing concern over the appalling shift in the epidemiology, microbiology, and ultimate clinical outcomes of the IRGN. In this modern era, the developed countries have seen a progressive change in the face of this GN with larger number of adults being affected, particularly the elderly and the immunocompromised. In our study, we saw an almost equal number of adults (50.3%) and pediatric cases (49.7%). The developing countries have a large burden of IRGN, with a relatively small numbers of the actual cases, reaching health-care facilities. The true incidence of IRGN is likely much higher as compared to the numbers described in literature as epidemiologic studies include only symptomatic patients, and it is known that subclinical IRGN is at least four times more common than clinically evident disease. Most reported series of IRGN from around the world report male predominance with male:female ratio ranging from 1.4:1 to 3:1.,,, Our population had a slight male predominance with the male:female ratio at 1.07:1. In the pediatric age group, the sites of infection are usually the throat or skin; however, the adult population shows a much-varied site of preceding infection including upper respiratory tract, skin, lung, heart, urinary tract, teeth/oral mucosa, bone, and deep-seated visceral, or somatic abscesses. In one study of 109 elderly patients from the United States, the four most common sites were skin (28%), lung (16%), urinary tract (13%), and upper respiratory tract (10%). The teeth and gums were a common site of infection in two series of adult IRGN from Europe., In our series, the most common infection was a sore throat followed by pyoderma and UTI. Interestingly, we had six patients with scabies, which showed no clinical (absence of fever, purulent discharge, or other signs of inflammation) or laboratory evidence (absence of raised white cell counts and negative skin swab) of super added bacterial infections, which had presented to us with IRGN. This is a very rare presentation of IRGN. In both pediatric as well as the adult populations, the most common presentation is an acute nephritic syndrome with new onset hematuria and proteinuria, edema, hypertension, and reduced renal function. Hypertension is present in 60%–84% of adult patients at presentation.,, The degree of proteinuria varies from <1 to >3 g/day, with a 25%–30% of patients presenting as a nephrotic syndrome. Almost all patients have microhematuria, and gross hematuria occurs in 17%–56% of patients., Serum creatinine at presentation is elevated in a majority of patients, and it is higher in elderly patients than younger adults., In contrast to children in whom the need for dialysis for severe acute renal failure is uncommon, close to a half of elderly patients require dialysis at the initial presentation for uremic symptoms and/or fluid overload., Approximately, 81% of our population had presented with new onset hypertension and 94.8% of the cases had hematuria (gross or microscopic). The need of RRT was higher in the adult population (n = 16/69) in our series as compared to the pediatric population (n = 8/68). Hypocomplementemia is usually seen in 35%–80% of adult patients and in 90% of the children.,,,, In most patients, C3 is depressed with a normal level of C4. In our series, 89.7% of patients had low C3 at presentation and 10.5% of patients persisted to have low C3 levels at the end of 8 weeks and therefore underwent a renal biopsy. The most common LM finding on renal biopsy is diffuse proliferative and exudative GN with abundant intracapillary neutrophils. In one study of 86 patients, this pattern was seen in 72% of patients, followed by focal endocapillary proliferative GN in 12% and mesangial proliferative GN in 8%. In our series, the most common LM pattern was the typical endocapillary proliferative GN seen in 60.2% of the patients. The next most common pattern seen was a diffuse endocapillary with mesangial proliferation seen in 39.78% of the patients. Crescentic and necrotizing GN with >50% crescents is rare and has been described to affect around 5% of cases in one study, although focal crescents involving >20% of glomeruli are encountered in up to a quarter of cases., In our series, cellular crescents were seen in 36.5% of patients with only 18.2% of patients showing >20% glomeruli involved with crescents. None of our patients had evidence of >50% crescents. Given the prevalence of age-related comorbidities, such as diabetes and hypertension, renal biopsies from adults with IRGN frequently show some underlying glomerulosclerosis, tubular atrophy, interstitial fibrosis, arteriosclerosis, and arteriolar hyalinosis, findings that are exceptional in children with IRGN., Our study cohort showed acute tubular injury in 6.45%. On IF, C3 dominant or codominant glomerular staining is most commonly seen. It may show various patterns, which have been typically described as “starry sky pattern” or the “garland pattern” or the mesangial pattern depending on whether the capillary wall or mesangium is stained.,,, C3 may be the only immunoreactant detected, but more often there is co-deposition of one or more immune reactants., IgA deposits present in a dominant or codominant fashion now form the basis of a relatively new entity which has been named as IgA dominant PIGN. In our cohort, we had a predominance of C3 deposits in dominant or codominant pattern seen in 92 patients. IgA deposits in a dominant or codominant pattern were seen in 16 patients, more commonly in the adults (n = 11) as compared to children (n = 5). In contrast to children, in whom complete recovery is the rule in a majority, sizeable number of adults do not recover the renal functions. About 8%–54% of patients may develop persistent renal dysfunction and 4%–33% progress to end-stage renal disease.,,,,,, In our series, complete recovery was seen in 83.2% of cases and 8.09% of patients had persistent renal dysfunction. 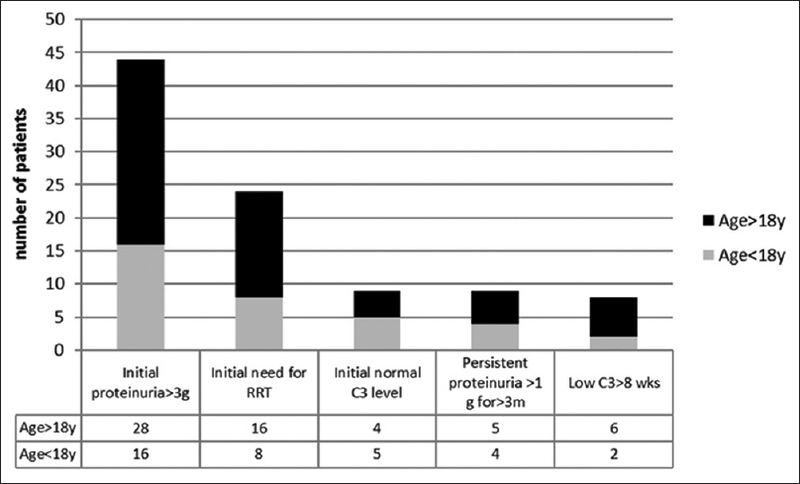 Of the patients who showed incomplete or partial recovery, those of whom had predominant C3 deposits could form a part of the C3 glomerulopathy spectrum. Even though acute nephritic syndrome is the still the most common presentation, patients presenting with a nephrotic syndrome may also be screened for PIGN, especially if they show a preceding infection or low C3 levels. Renal biopsy plays an important role in the assessment of prognosis and underlying GN and should be considered early, especially in patients with an initial requirement of RRT or severe proteinuria/persistent proteinuria. Subclinical nature of PIGN with a more protracted course may contribute to increasing recognition of mesangial deposits on biopsy, which may be indicative of the resolution phase and hence may show less severe clinical and laboratory features. Initial RRT requirement and presence of IgA deposits in biopsy may predict a poor outcome and greater chances of progression to CKD. The strength of this study is the relatively large cohort of patients who have been followed up for a mean time of 1 year or more and have also been subjected to a renal biopsy. This study is limited by the fact that it may not be a true representation of the disease in the community and represents only the tip of the iceberg since our department being a tertiary care unit, receives the relatively worse cohort of patients. And lastly, our center being a public health setup with severe resource limitations, we were unable to subject the biopsy samples to an electron microscopy examination, which may have put light on various other histopathological features of this disease. Nasr SH, Radhakrishnan J, D'Agati VD. 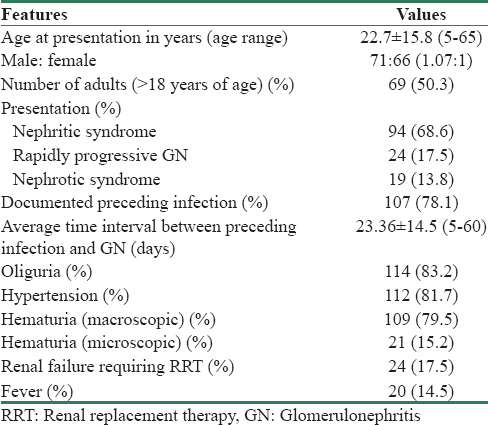 Bacterial infection-related glomerulonephritis in adults. Kidney Int 2013;83:792-803. Rodríguez-Iturbe B, Rubio L, García R. Attack rate of poststreptococcal nephritis in families. A prospective study. Lancet 1981;1:401-3. Nasr SH, Markowitz GS, Stokes MB, Said SM, Valeri AM, D'Agati VD. Acute postinfectious glomerulonephritis in the modern era: Experience with 86 adults and review of the literature. Medicine (Baltimore) 2008;87:21-32. Montseny JJ, Meyrier A, Kleinknecht D, Callard P. The current spectrum of infectious glomerulonephritis. Experience with 76 patients and review of the literature. Medicine (Baltimore) 1995;74:63-73. Moroni G, Pozzi C, Quaglini S, Segagni S, Banfi G, Baroli A, et al. Long-term prognosis of diffuse proliferative glomerulonephritis associated with infection in adults. Nephrol Dial Transplant 2002;17:1204-11. Haas M, Racusen LC, Bagnasco SM. IgA-dominant postinfectious glomerulonephritis: A report of 13 cases with common ultrastructural features. Hum Pathol 2008;39:1309-16. Nasr SH, Fidler ME, Valeri AM, Cornell LD, Sethi S, Zoller A, et al. Postinfectious glomerulonephritis in the elderly. J Am Soc Nephrol 2011;22:187-95. Keller CK, Andrassy K, Waldherr R, Ritz E. Postinfectious glomerulonephritis – Is there a link to alcoholism? Q J Med 1994;87:97-102. Luo C, Tang Z, Chen D, Liu Z. Long-term prognosis for Chinese adult patients with acute postinfectious glomerulonephritis. Clin Nephrol 2011;76:186-94. Sorger K, Gessler U, Hübner FK, Köhler H, Schulz W, Stühlinger W, et al. Subtypes of acute postinfectious glomerulonephritis. Synopsis of clinical and pathological features. Clin Nephrol 1982;17:114-28. Wen YK. The spectrum of adult postinfectious glomerulonephritis in the new millennium. Ren Fail 2009;31:676-82. Srisawat N, Aroonpoonsub L, Lewsuwan S, Kanjanabuch T, Avihingsanon Y, Praditpornsilpa K, et al. The clinicopathology and outcome of post-infectious glomerulonephritis: Experience in 36 adults. J Med Assoc Thai 2006;89 Suppl 2:S157-62.